My 7 and 10-year-old children immediately decided to have a “marker contest,” where one person would use another set of markers, and the other would use the new ones. They decided on a farm theme. We turned on a video from one of their favorite drawing video channels so they could get to work. My 7 and 10-year-old children have shared a set of good quality German markers this year. My 5-year-old isn’t allowed to touch those markers because she would damage the tips. But, my 5-year-old used The Magic Stix Washable Markers many times over the last month and she didn’t damage them at all. Magix Stix markers have great durability. I already swtiched to buying them better quality markers because the cheaper markers don’t last as long and the colors bleed together. It’s not that much more for some quality markers and if the kids will take care of them, they’re worth spending more so they last the whole year and the kids are happier with their drawings. The plastic case the markers came in works really well and my kids have kept the markers cleaned up. Even my 5-year-old could easily open and close the case and get the markers back in so that the case would close. Nobody needed any help from me to do that, which makes me really happy. I cannot tell you how many cardboard marker cases my 5-year-old has destroyed. We have cups for loose markers but the little kids never seem to remember which cup is for what. These markers stayed organized over the course of a month and I didn’t have to remind the kids to put them away. I heartily approve of this mess-free development. 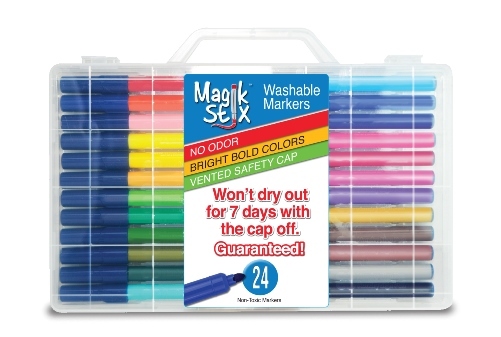 The Magic Stix Washable Markers have a claim that they won’t dry out for 7 days with the cap off. We didn’t formally test that claim. I thought for sure that at least once during the month someone would leave a cap off but I guess due to the nice case, everyone kept putting the markers away. My 5-year-old left the caps off while coloring (sometimes the kids have some long coloring sessions) and no markers dried out. My 5-year-old is very rough on markers (leaving caps off and smooshing the tips are the primary issues), so the fact that these markers held up really says a lot about their good quality. My kids want markers that give good coverage, and that have some way of accurately telling them the color that they will make. We had to start the first coloring contest over because of issues with our old marker’s color coming out too different from the cap. Magic Stix plastic body colors are not always accurate, but the tip of the marker shows exactly what color the marker is going to make, which is great. Our other markers are not accurate either in the cap color or in the color of the tips. Here you can see the plastic body color is different, but the color of the pig is the exact same color as the tip of the marker. The kids know ahead of time what the color will look like on white paper. The kids decided to switch to Magic Stix Washable Markers. They made this display. The middle drawing shows a horse that was colored with our old markers and came out completely the wrong color – too dark to see any detail on the body and the mane is orange rather than rust. This has been an issue with the old markers this year. The left drawing was a re-do with the old markers, they said it was ok and they liked having the option of thinner black lines (the other markers were double-sided with a thick and thin side), but they like the coloring qualities of the Magic Stix better for all the filling in. The Magic Stix marker is on the right, and is their favorite drawing. They love the vibrant, accurate colors. They made a bunch of drawings this month and we saw no decline in the functionality of the markers. They put away the old markers and haven’t gotten them out again, instead preferring to share the set of Magic Stix. Technically my 5-year-old is still supposed to use her own set of markers, but she has used these many times and they’re still in perfect shape. These markers were mess-free – they really washed completely out of the kid’s clothes. These are awesome markers and I’ll buy them every year.